Production: Warner Bros. Pictures, Inc.; black and white, 35mm; running time: 101 minutes. Released June 1951. Filmed fall 1950 in New York City, Washington, D.C., and Darien, Connecticut, and at an amusement park constructed on Rowland V. Lee's ranch in Los Angeles. Producer: Alfred Hitchcock; screenplay: Raymond Chandler and Czendi Ormonde, adapted by Whitfield Cook from the novel by Patricia Highsmith; photography: Robert Burks; editor: W. H. Ziegler; sound: Dolph Thomas; production designers: Ted Haworth and George James-Hopkins; music: Dimitri Tiomkin; special effects: H. F. Koenekamp; costume designer: Leah Rodes. Cast: Farley Granger ( Guy Haines ); Ruth Roman ( Ann Morton ); Robert Walker ( Bruno Anthony ); Leo G. Carroll ( Senator Morton ); Patricia Hitchcock ( Barbara Morton ); Laura Elliot ( Miriam Haines ); Marion Lorne ( Mrs. Anthony ); Jonathan Hale ( Mr. Anthony ); Howard St. John ( Capt. Turley ); John Brown ( Professor Collins ); Norma Varden ( Mrs. Cunningham ); Robert Gist ( Hennessey ); John Doucette ( Hammond ); Charles Meredith ( Judge Dolan ); Murray Alper ( Boatman ). Chandler, Raymond, and Czendi Ormonde, L'Inconnu du nord-express (Strangers on a Train) , in Avant-Scène du Cinéma (Paris), 1 December 1982. Amengual, Barthélemy, Hitchcock , Paris, 1960. Bogdanovitch, Peter, The Cinema of Alfred Hitchcock , New York, 1962. Wood, Robin, Hitchcock's Films , London, 1965; revised edition, as Hitchcock's Films Revisited , New York, 1989. Truffaut, François, Le Cinema selon Hitchcock , Paris, 1966; as Hitchcock , New York, 1985. Simsolo, Noël, Alfred Hitchcock , Paris, 1969. LaValley, Albert J., editor, Focus on Hitchcock , Englewood Cliffs, New Jersey, 1972. Durgnat, Raymond, The Strange Case of Alfred Hitchcock , Cambridge, Massachusetts, 1974. Spoto, Donald, The Art of Alfred Hitchcock , New York, 1976. Taylor, John Russell, Hitch , London, 1978. Silver, Alain, and Elizabeth Ward, editors, Film Noir , New York, 1979. Bazin, André, The Cinema of Cruelty: From Buñuel to Hitchcock , New York, 1982. Spoto, Donald, The Life of Alfred Hitchcock: The Dark Side of Genius , New York, 1982; London, 1983. Villien, Bruno, Hitchcock , Paris, 1982. Deutelbaum, Marshall, and Leland Poague, editors, A Hitchcock Reader , Ames, Iowa, 1986. Kloppenburg, Josef, Die dramaturgische Funktion der Musik in Filmen Alfred Hitchcock , Munich, 1986. Sterritt, David, The Films of Alfred Hitchcock , New York, 1993. Harris, Robert A., Complete Films of Alfred Hitchcock , Secaucus, 1999. Hart, Henry, in Films in Review (New York), June-July 1951. Winnington, Richard, in Sight and Sound (London), August-September 1951. Feuga, Pierre, in Arts (Paris), May 1954. Truffaut, François, and Claude Chabrol, "Rencotre avec Hitchcock," in Arts (Paris), February 1955. Seguin, Louis, in Positif (Paris), November 1955. Chabrol, Claude, in Arts (Paris), 28 December 1955. "Hitchcock Issue" of Cahiers du Cinéma (Paris), August-September 1956. Higham, Charles, "Hitchcock's World," in Film Quarterly (Berkeley), Winter 1962–63. Sonbert, Warren, in Film Culture (New York), Summer 1966. Zucker, Phyllis, "Robert Walker," in Films in Review (New York), March 1970. Humbert, M., and D. Delosne, in Image et Son (Paris), no. 286, 1974. Laemmle, Ann, in Cinema Texas Program Notes (Austin), 14 September 1978. Marty, A., "L'Inconnu du nord-express et le Maccarthisme," in Image et Son (Paris), July-August 1980. Douglas, J.Y., "American Friends and Strangers on Trains," in Literature /Film Quarterly (Salisbury, Maryland), vol. 16, no. 3, 1988. Sered, J., "The Dark Side," in Armchair Detective, no. 22, no. 2, 1989. Corber, R. J., "Reconstructing Homosexuality: Hitchcock and the Homoerotics of Spectatorial Pleasure," in Discourse (Bloomington, Indiana), Spring-Summer 1991. Matthews, J.J., in Scarlet Street (Glen Rock), no. 6, Spring 1992. Reid's Film Index (Wyong), no. 8, 1992. Desowitz, B., "Strangers on Which Train?" in Film Comment (New York), vol. 28, no. 3, May-June 1992. Chin, Paula, "Through a Mind, Darkly: Writing of Murder and Madness, Patricia Highsmith Heeds a Strange Muse," in People Weekly , vol. 39, no. 1, 11 January 1993. Séquences (Haute-Ville), no. 179, July-August 1995. Lilley, Jessie, "Granger on a Train," in Scarlet Street (Glen Rock), no. 21, Winter 1996. Valley, Richard, "The Trouble with Hitchcock: Stage Fright and Strangers on a Train Investigated!" in Scarlet Street (Glen Rock), no. 21, Winter 1996. Alfred Hitchcock based Strangers on a Train (1951), one of his most suspenseful thrillers, on the novel by Patricia Highsmith. 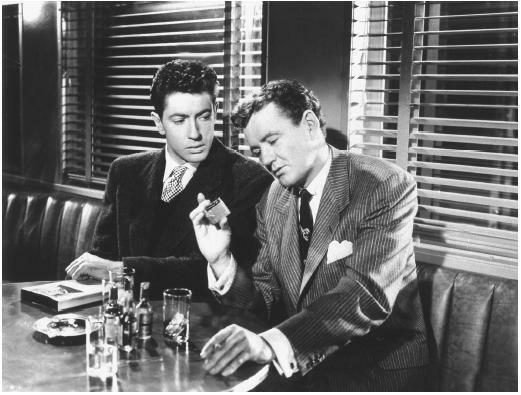 It begins with a railway journey, in the course of which Bruno Antony, a wealthy homosexual (Robert Walker, in an immaculate performance), ingratiates himself with Guy Haines, a handsome tennis champion (Farley Granger). The slightly effeminate Bruno has all the earmarks of a textbook case in abnormal psychology, since he combines a deep-seated, implacable hatred of his domineering father with a curious attachment to his eccentric mother. As the two lunch together on the train, it is evident that Guy, who is unhappily married to a conniving, promiscuous spouse, is fascinated by this fey, coyly ingratiating creature—so much so that from the start there is an unacknowledged homosexual undertone to their relationship. Farley Granger is cited in Vito Russo's The Celluloid Closet (1987) as saying that "it was Robert Walker's idea to play Bruno Antony as a homosexual." On the contrary, it should be obvious from the foregoing remarks about Bruno's background and behaviour that his approach to Guy as a rather blatant homosexual courting a latent one is embedded in the subtle screenplay, and not something Walker, as brilliant as he is in the part, superimposed on the characterization. Before they part company at journey's end, Bruno tries to manipulate Guy into agreeing to kill Bruno's father, in exchange for Bruno murdering Guy's wife, Miriam. Since neither of them has an ostensible motive for committing the other's crime, they would both, according to Bruno's logic, successfully elude detection. This proposal appeals to Guy more than he is prepared to admit, since he would like to be rid of his hateful wife. Consequently, he does not reject Bruno's plan immediately. Taking Guy's indecision for tacit approval, the deranged Bruno kills Miriam and demands that Guy keep his part of the bargain, which Guy, in a moment of panic, agrees to do, just to get rid of Bruno. For novelist Patricia Highsmith, the way in which Bruno plays on the baser instincts of the fundamentally good-natured Guy signifies the duality that lies at the heart of human nature. Gordon Gow quotes her in Hollywood: 1920–70 as saying, "I'm very much concerned" with the way that good and evil exist in everyone "to a greater or lesser degree." Raymond Chandler, the eminent crime novelist ( The Big Sleep ) and screenwriter, was very much preoccupied, as was Hitchcock, with bringing to light the dark corners of the human psyche; he accepted Hitchcock's offer to draft the screenplay for Strangers. One of the most tense scenes in the picture is that in which Bruno strangles Guy's estranged wife in a secluded corner of the amusement park. Ironically, the murder is accompanied by the distant music of the merry-go-round's calliope, as it grinds out its cheery rendition of "The Band Played On." Horrified, we watch the murder as it is reflected in Miriam's glasses, which have fallen onto the grass during her struggle with Bruno. Photographed in this grotesquely distorted fashion, the strangling looks as if it were being viewed in a fun-house mirror, another reminder of the grimly incongruous carnival setting of the crime. Given the fact that Guy subconsciously wanted Miriam dead, he has, in effect, accomplished her death through the mediation of Bruno as his proxy. Guy has become, however unwittingly, allied with the perverse force of evil that Bruno represents; this is confirmed in the scene in which the two men stand on opposite sides of an iron fence, as Bruno informs Guy that he has taken Miriam's life. When a police squad car appears across the street, instinctively Guy joins Bruno on the same side of the barrier, and thus acknowledges implicitly his share of the guilt in Miriam's demise. Moreover, the image of Guy's troubled face barred by the sinister shadows of the gate grill signals his imprisonment by Bruno in an unholy alliance from which he finds himself, for the time being, powerless to escape. Guy is suspected of killing his wife; but he is given the chance to redeem himself by pursuing Bruno back to the scene of Miriam's murder and forcing him to confess the truth about her death. As they wrestle with each other aboard the carousel, the mechanism suddenly goes berserk, changing from a harmless source of innocent fun into a whirling instrument of terror. Thus the carousel is a reflection of Hitchcock's dark vision of our chaotic, topsy-turvy planet. As the runaway merry-go-round continues to spin at top speed, its rendition of "The Band Played On" is also accelerated to a dizzying tempo and mingles with macabre persistence with the screams of the hysterical riders trapped on board. A mechanic at last manages to bring the carousel to a halt, but it stops so suddenly that the riders go sailing off in all directions, as the machinery collapses into a heap of smoldering wreckage. As the movie draws to a close, Bruno dies in the debris, unrepentant to the last.